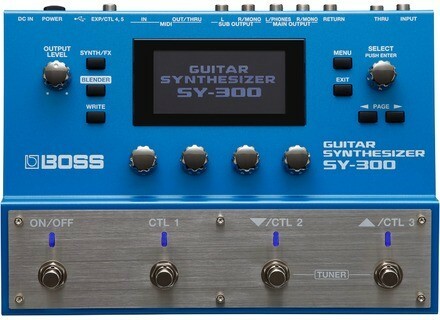 SY-300, Multi-Effects for Electric Guitar from Boss. In the past, trying to find a guitar synth that tracked accurately was akin to searching for the Holy Grail. No product, whether it was a guitar synth or MIDI guitar controller was able to accurately reproduce guitar playing down to its nuances. Heck, most couldn’t even handle a string bend very well. 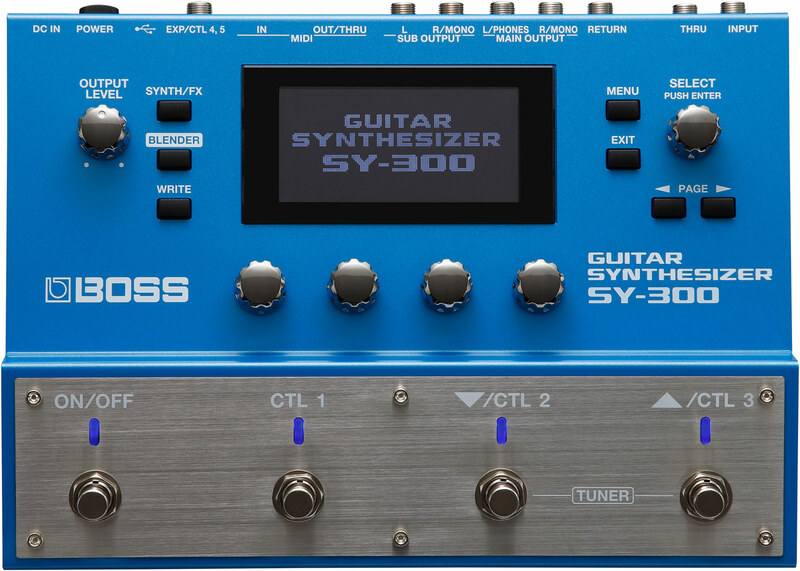 But Boss has changed all that with the SY-300, a synthesizer that is triggered by a guitar (or other instrument’s) incoming audio signal, no special pickup required. It’s a revolutionary idea, and from a tracking standpoint it succeeds brilliantly. ericslide's review"Sound synthesis for guitar players?" Sound synthesis for guitar players? Exactly! Ladies and gentlemen, from now on sound synthesis no longer is the privilege of the sole keyboard players! But was it really the case until now? - the SY300 has NOTHING TO DO with whatever was available before and usurped the name of "guitar synth". Nothing to do. I won't quote any brand, but there are not so many to sell guitar synth pedals that sound nothing serious. - the SY300 is not to be compared with all the Roland GKxx-type MIDI pickups, either in technology or the approach of their practical use to make music. These MIDI pickups (hexaphonic guitar pickups) are used to trigger real, sampled sounds of piano, sax, violins (and so on) and even... guitars (sic, getting a guitar sound while playing the guitar, how amazing!). Nothing to do either. As far as I'm concerned I never took this road, if I want to play the piano i play the piano, or ask a piano-playing friend to do this for me. But this is up to everyone and the SY300 is absolutely not a competitor for such systems. And, don't forget, the input source of the SY300 is SOUND! Not a MIDI value! A great difference, isn't it? Just to say that, of course, no hexa MIDI sensor is needed to use the SY: your guitar’s standard jack will do. - so the SY300 is a synth! Yes, a synth which input is whatever you feed it with – not literally, of course, what I mean is, the SY300 accepts all sorts of sound sources, not only guitars but really all sorts of sound sources, even mic’ed voices. - it also features a multieffects that leaves behind most dedicated multieffects you can find these days. I’m a former HD500 user so I can compare: soundwise and regarding ease of use, they don’t compare. Direct feature editing is as simple as it was difficult to edit the HD500 without using Line6’s software editor. Boss also released a soft editor for the SY300, I do use it but I can just as easily configure everything with the box in standalone, with no GUI. A definite plus in my eyes. The SY300 is a synth, which involves that if you have no technical knowledge whatsoever regarding sound synthesis you’re gonna have a hard time developing your own sounds with it (the multieffect function left aside). It is indeed necessary to know at least a few things in that regard to use the SY300 for something else than the original presets which I’d call, err… pure sh*t, except for 4 or 5 out of 70. I personally learnt it all with a few Korg synths (including the MS20 and DSS-1, many years ago) and now I still use the Micro Korg, a real wonder that has all the roots of what you can do with a synth and a keyboard. Then come the filters : length, cut, resonance,. I’m not detailing everything here but these parameters are enough to show that we are here in the world of sound synthesis and that, obviously, the sound creation possibilities are almost infinite, and I’m only mentioning the synth’s basics. The SY300 offers many more wonders such as a small 16-step sequencer that you can set up as you like. This pedal (sounds a bit restrictive compared to how powerful it is but hey, it is meant to be activated using your foot) also features a tuner, and allows to associate CTL switches to precise functions (like opening the filters on a patch). Let’s now consider routing, or how the sound « travels » through the synth. This is one of the SY300’s strongest points. You can route oscillators it almost any way you like, just like the multieffect if you use it (you don’t really have to if you don’t want to). While it only has one “in” (which is way enough), the SY300 offers two “out” busses, MAIN and SUB (stereo or mono/L if need be). It is possible to assign the oscillators’ and effects’ routings to either, or both. As far as I’m concerned, for now, I only use the SUB out (I’ll explain why in a minute). There’s also a THRU jack output which allows keeping the raw, unprocessed guitar sound, unaffected bu the SY300’s sound synthesis modules (unless of course a stompbox or another effect is places before the SY300 in in the chain). - a jack comes out of the THRU out (raw, unaffected guitar signal) to my pedalboard. Yes, I have kept my good ol’ analog stompboxes (see pic), with the likes of Maxon OD, chorus, Boss DD20 and so on, YET I’m gonna dig deeper into the SY300’s multieffect section as the chorus and delays I’ve tried so far are very good, just like the OD/Dists (hey, there's even a metal zone sound!). - The SY300’s sound comes out of the SUB jack outs to one of my PA’s stereo inputs. NEVER route the SY300 towards an amp!! Well, of course you can do what you please, but it just sounds awful, and by the way it wasn’t even designed for that. If Boss made it this way and included two stereo outs, it’s not just like that. The sound, by the way : I’m currently using a dozen different patches (none of the factory ones, or deeply remodelled from some of them). My arsenal is quite simple: “synth strings”-type sounds, some fat moog-style leads (EVERYTHING is possible with chords), a metal zone (with no oscillators, well, just like a real MT2 except I can add a reverb, delay, compressor and so on if need be) and other great sounds, some old-sounding but all come well with the band’s songs, which is what matters. Sounds are synthesized sounds, keep that in mind,. Once again, we’re not here expecting perfect modelling of a symphonic orchestra or a big band, but frankly, even only for the strings, it does the trick. I am approximately at 10% of what I can get out of this SY300, so I’ll update my review later in a little time. There are also a lot of SY300-related videos on Youtube, but I’d say 80% of them are hopelessly useless, with people only reviewing the 70 (bad-sounding) factory presets, which are just as useless as those videos. In a nutshell, I wouldn’t hesitate to say the SY300 is a real turning point, not only regarding synth guitars (how I HATE this expression – it just should be banned!) but even sound synthesis. For synthesis addicts, who never dreamed to activate the ADSR adequation with the palm of their hand – not with a keyboard and keys? Well, Boss made it with the SY300. Incredible, but true, my friend! Your guitar-player’s hand does it all ! (well, technically essentially the attack and release, the decay and sustain can be set up within the SY). Overall, it’s really, really good!